When you’re always on the move at work – be it offsite or just from meeting to meeting – it can be hard to even take the time for lunch, let alone some healthy and quick lunches. The more likely scenario is that you’ll either skip the meal altogether or simply grab whatever’s closest, which may or may not be fast food. Unfortunately, neither option will help give you the energy you need to power through the second half of your day. Instead, you’re going to need to do some advance planning and ingenuity to break out of the “fast food feast or famine” rut. You might just be amazed at how much better you feel in the afternoons once you’ve started making healthier choices, as well as putting in a little bit of effort to ensure that you’re in control of your lunch. The good news is that you don’t need to sacrifice either nutrition or time to have a satisfying midday meal. Here are a few tips for putting together some healthy and quick lunches — ideal for days when you’re crunched for time. One of the most common pieces of work-lunch advice is also one of the best: Set aside some time on Sunday evenings to put together all the components of your healthy and quick lunches. If that means making additional time to cook a meal that you’ll then portion out throughout the week, then work that into your weekend tasks as well. It’s typical to hear that a lot of people don’t eat healthy because they don’t have the time to put together a homemade meal; scheduling some time on the weekend to make a big batch of chili or pasta yields both a healthy and cost-effective result. It could even be as easy as putting aside some leftovers from a weekend dinner for your weekday lunches over the next few days. Meal prep also means taking a few minutes the night before work to assemble your lunch and put it in the fridge for fast grabbing in the morning. Make sure you have all the components packed together, and try putting a neon-colored sticky note on the lunch bag if you have the habit of being forgetful. One of the best ways to make healthy and quick lunches for both kids and adults is by using the bento box. This traditionally Japanese lunchbox is set up to contain many smaller compartments inside one larger container, which means that you can pack a variety of things without having them leak into each other. 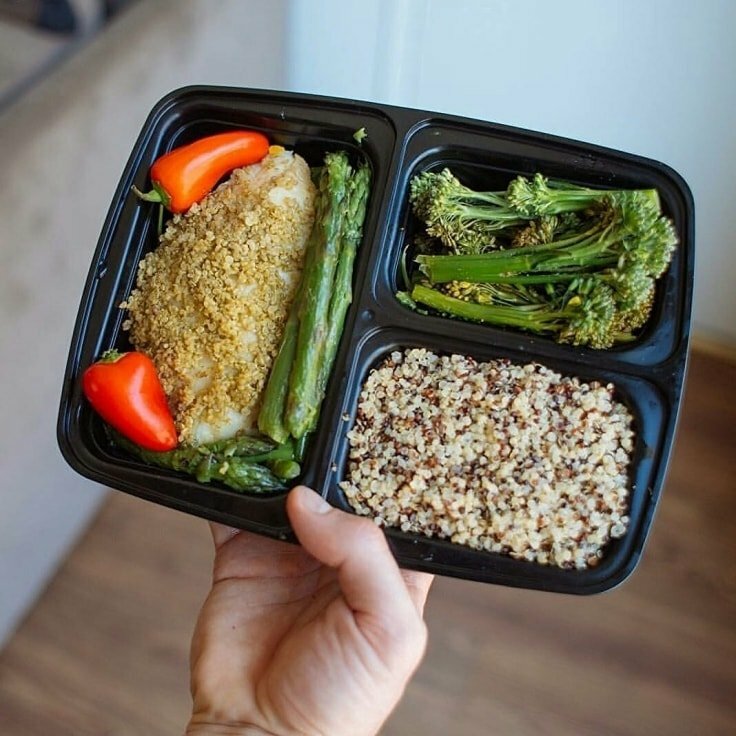 As a bonus, the compartments act as built-in portion control, which means you can put together a light meal that won’t leave you asleep on your desk later. Another bonus: You can nibble away on various components throughout the day, so there’s no worrying about finishing a hot meal before jumping on the next conference call. Get bento boxes on sale from Amazon. The Kitchn has got a ton of “sandwich-free” lunch ideas that revolve around the bento-box setup, including the makings for cold noodle salads, quesadillas, or a hummus plate. 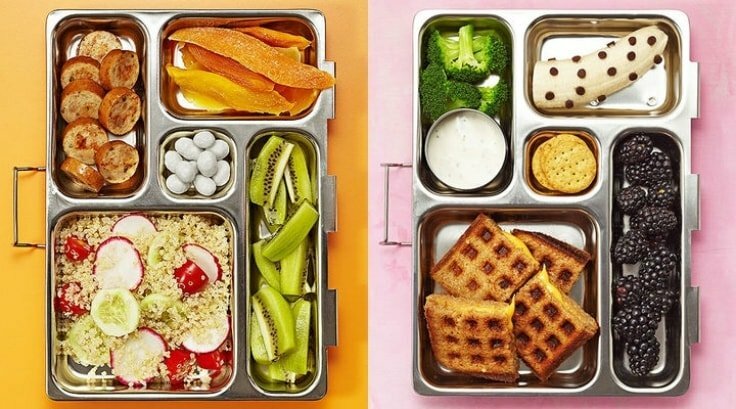 Speaking of kid lunches, it’s not so outlandish these days to take a hint from your child’s lunchbox when it comes to packing a quick on-the-go meal. A lot of kid-friendly options are quickly consumable, easily eaten with your hands, and don’t require much prep work. They’re also fairly uncomplicated, meaning that you won’t be scrambling for missing utensils or a microwave that’s not already in use. Or try to pack breakfast foods for lunch. For more ideas, check out this list at The Muse, which prominently features a ton of soup recipes that may remind you of your school days but with a decidedly grown-up twist (such as Martha Stewart’s take on tomato soup, or an easy one-pot chicken noodle soup). This may sound like weird advice at first, but if you don’t pack a lunch that you’re looking forward to eating, the more likely it is that you’ll end up buying something less healthy to satisfy yourself. You may have the best intentions packing that plain salad and yogurt, but if lunchtime rolls around and the free office pizza looks that much better, then you’re going to be tempted. Be honest with yourself about what kind of lunches get you excited, then look for healthy alternatives or more nutritional modifications. If you’re not stoked on the lunch you’ve packed for yourself, it’ll be all too easy to skip it and grab something unhealthy while you’re out and about. If you’re on the move throughout the day, sometimes you might not know when — or where — you’ll get to take your lunch break. That’s why it’s important that you consider spoilage prevention if you’re packing items like meat, which can make you sick if bacteria are allowed to grow on its surface. Invest in some good ice packs to put in an insulated lunch bag in order to keep potential food poisoning at bay — and to keep cold food or drinks at a cool temperature. Get an insulated lunch bag on sale from Amazon. Likewise, if you’re going to be bringing a lot of soups and stews, buy either an airtight thermos or a microwavable mug container that can go where you do. 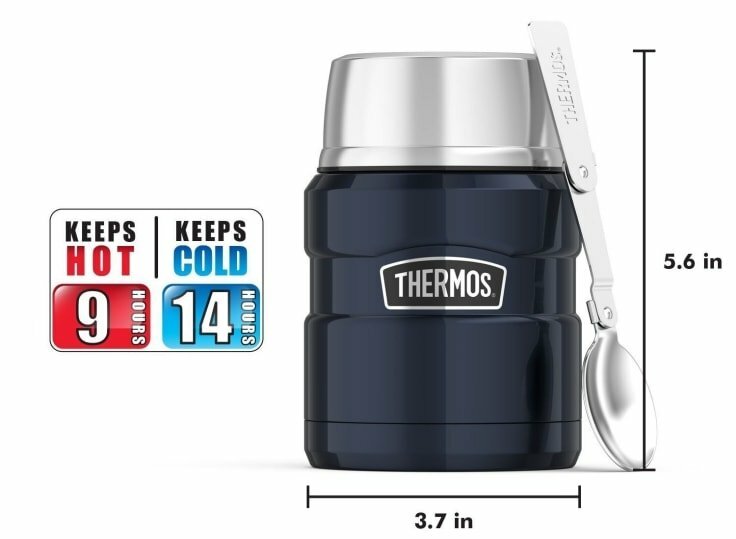 Get a Thermos food jar on sale from Amazon. As we said earlier, if you’re on the go during the work week, you might not be able to plan when you’ll get to eat your lunch. But if you have the option, it’s highly recommended that you take even fifteen minutes to sit down and eat the lunch you prepared, rather than over your work keyboard or while walking to your next meeting. You’ll be more satisfied with your meal if you take some time to unplug your brain and concentrate on what you’re eating rather than what client you need to meet with next, or a presentation you have to prepare for. 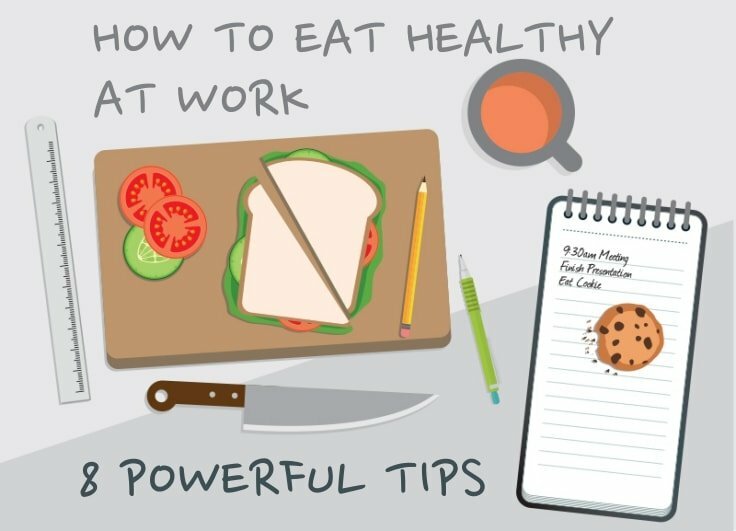 If you’re working the kind of job that requires you to be constantly on the move, you’re going to need to do some planning to ensure that you’re getting a healthy and quick lunch that doesn’t involve fast food chains. It might take a little more effort and some extra equipment, but it’s going to do a world of good for your energy levels, your waistline, and your wallet. Just make sure that you definitely don’t skip out on your midday meal, no matter how rushed you are — you’re going to need that fuel to make it through the rest of your day. What’s your best tip to ensure you’re getting some healthy and quick lunches during a busy week? Share it with us in the comments. We’re all pretty good at making excuses when it comes to things like exercising. So here are a few tips to help you stop doing it. If you want to improve your golfing skills, then you shouldn't miss these contructive golfing tips. Follow them to become a better golfer. If you're not into mountain biking already, then these six handy benefits of this awesome outdoor sport will change your mind. Want to disconnect and recharge your mind and body? Pick your favourite destination from these 7 wellness retreats from around the world and go "crazy"! Curvier women can look fabulous too by choosing an awesome plus size activewear and wearing it with confidence. Whether you're a pro, or in a high school baseball team, a baseball tryout can be nerve wrecking. So check out some tips to help you manage your stress during a tryout. There are some ways in which regular stretching can help write your college papers better. Read this article to know more.